Figure 1: Location of the North Carnarvon Basin on the Australian North West Shelf and the 20,000 km2 Olympus MC3D. Spectrum has completed comprehensive broadband reprocessing of 19 contiguous legacy 3D surveys in the North Carnarvon Basin, offshore the North West Shelf of Australia, one of the most prospective hydrocarbon provinces in the world (Figure 1). All surveys were processed as one volume from field tapes and the result is a fully conformable and seamless dataset, named ‘Olympus’. This follows the theme of Greek mythology and is the place where the throne of Zeus was located and where Olympians such as Athena, Artemis, Demeter and Hermes resided – all of which happen to be the names of wells and/or 3D surveys within the area. 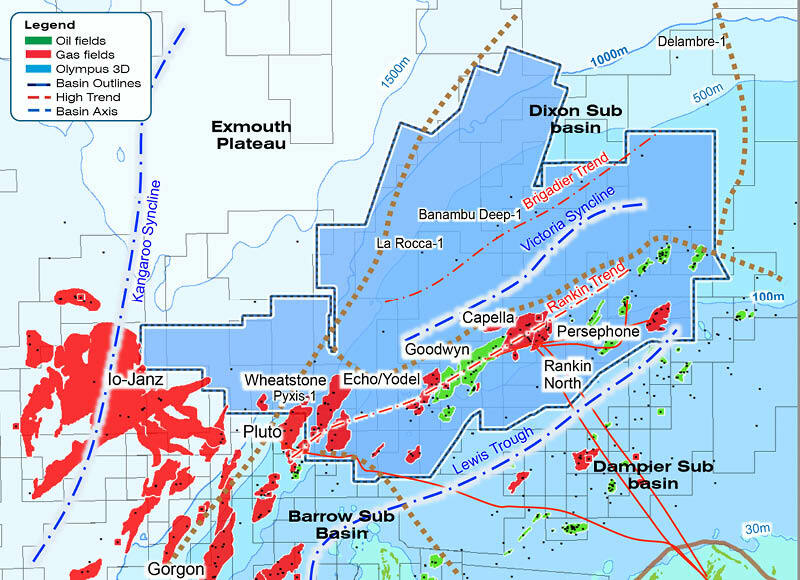 The reprocessed dataset covers nearly 20,000 km2 and encompasses 180 km of the Rankin Trend along the south-eastern margin of the shelf, where over 30 oil and gas fields have been discovered. The data is complete to PSTM (Pre-Stack Time Migration) and as the PSDM (Pre-Stack Depth Migration) nears completion the astounding fidelity of the data is bringing new insights to rejuvenate exploration in this prolific basin (Figures 4 and 5). Figure 2: The location of the Olympus 3D relative to the structural elements and main fields in its vicinity. The early results of the Olympus comprehensive broadband PSTM dataset, the first of its kind in the North Carnarvon Basin, have not only shown the significant uplifts that can be obtained from modern reprocessing of legacy data but have also revealed the potential of the ability to embark on fully integrated 3D basin studies tied to hundreds of wells. Even now, as the PSDM version of this data is being generated, the possibility of unearthing nearby exploration opportunities along the Rankin Trend looks very promising. Further afield across the Victoria Syncline the Olympus data will rejuvenate exploration by allowing accurate basin modelling and reservoir mapping to unravel the details of complex but potentially prolific charge migration and trapping systems that have been barely touched to date. The fortunes of Olympus and the underlying Mesozoic basin are truly rising! SEISMIC PANEL: PSTM dip line through seven legacy surveys showing the seamless results and high quality that can be obtained main fields in its vicinity. Broadband reprocessing gives new life to legacy datasets. 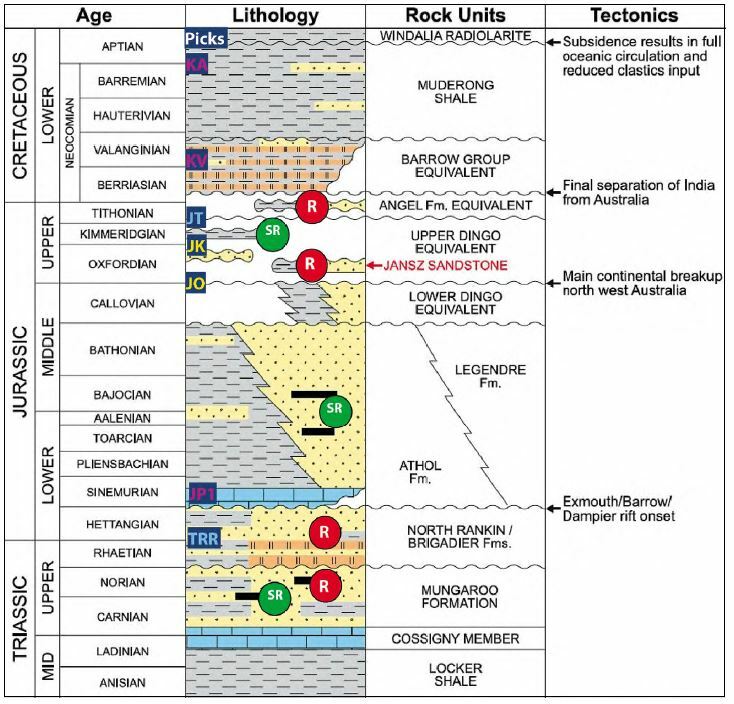 Figure 3: Stratigraphic column showing the main plays and tectonic events. The Rankin Trend is arguably the sweet spot on the Australian North West Shelf, with the initial North Rankin-1 discovery well having been drilled in 1971. Since then there have been a number of giant gas/condensate field discoveries along trend, including Goodwyn, Dockerel, Echo-Yodel-Sculptor, Perseus-Capella, Gorgon and Wheatstone-Pluto-Iago (Figure 2). Forty years later exploration drilling continues and oil and gas pools are still being found in a wider variety of hydrocarbon traps with more complex migration-charge histories. The Olympus 3D dataset, completed in association with Searcher Seismic, extends northward over the Dixon Sub-basin, which includes the better-known Victoria Syncline and Brigadier Trend. A large part of the survey is on the platform where water depths are between 50 and 250m but along the western margin towards the Exmouth Plateau the sea floor descends to 1,500m. The largely unexplored Victoria Syncline to the north of the Rankin Trend, which lies at the centre of the Olympus 3D dataset, is thought to be the Late Triassic to Early Jurassic source kitchen area for the Rankin Trend accumulations. In particular, the Goodwyn and Persephone fields have been mapped to have direct unobstructed migration pathways to the structural highs (Jablonski et al., WABS 2013). Exploration success is ongoing to the south where quantitative inversion techniques have been used to target stacked pay within the Mungaroo Formation. To the east in the Bedout Sub-basin, the Phoenix discovery is also in the Early Triassic and this success is now re-invigorating exploration on the Brigadier Trend to the north. The Olympus PSTM and PSDM dataset allows for seamless structural and attribute analysis from the proven hydrocarbon province into the under-explored northern area, not previously possible. This removes uncertainty in calibration between surveys and allows matched results across large areas. 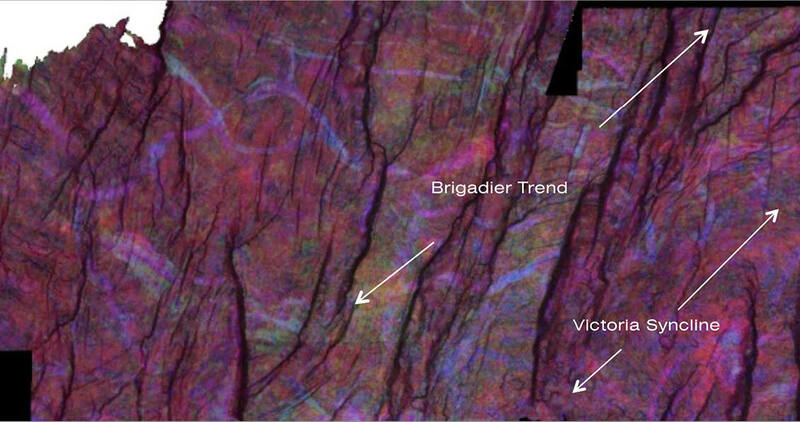 Figure 4: Preliminary Near Base Cretaceous (KV) on the PSTM volume. Note the strong effect in time of the platform break and canyons and the near north– south underlying structural grain overprinted by the Late Jurassic north-east to south-west continental breakup trend. The application of modern deghosting is perhaps the most significant addition to the processing tool box for conventionally shot data. Properly applied deghosting improves the zero-phase wavelet by reducing the side lobes, cleaning up the data and subsequently broadening the resultant bandwidth. As a result, the demultiple sequence has a cleaner dataset to work with and is more effective, allowing a more adapted pre-migration Radon transform and an improved velocity model. This is of particular relevance along the platform margin, where canyon walls and thin beds distort and cause constructive interference, particularly on the far offsets. 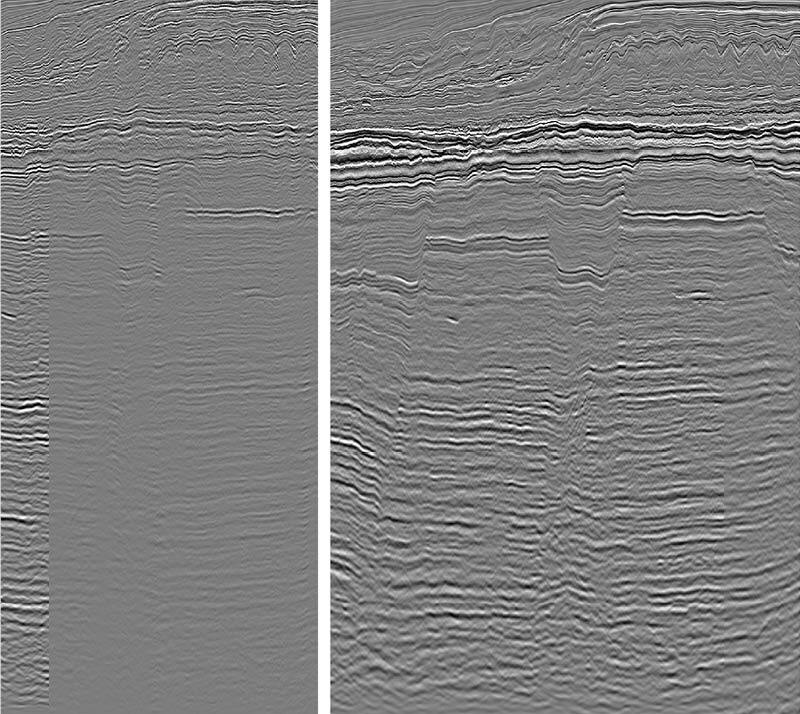 Figure 5: Comparison between legacy data (Rose and Banambu) (left) and the new broadband PSTM (right) showing a much cleaner-looking dataset with improved character, sharper faults and no obvious data quality variation between surveys. By combining multiclient and open file 3D data, a near contiguous dataset was reprocessed and this represents the first ‘fully processed from field tapes’ dataset incorporating so many surveys in this region, with a consistent inline direction roughly orthogonal to the regional grain (north-west to south-east). The major improvement in the data quality coupled with the massively increased computing power available means that a full-flow depth migration approach was also feasible at a reasonable cost and the results obtained by Down Under Geosolutions (DUG) confirms this improvement, as can be seen in Figure 5. Furthermore, for a fraction of the cost of new acquisition, such older datasets give better coverage in areas where there is more recent infrastructure installed and where stricter environmental and safety buffer zones are being required along with source power reductions, as is increasingly the case on the North West Shelf. More options from PSTM and PSDM datasets for calibrating wells and tying to existing legacy time data mean that a wider basin synthesis – or, indeed, semi-regional analysis in depth covering large structural trends and major discoveries, with hundreds of wells calibrated in – is possible. Regional trends can then be overlaid on more local evaluations to ensure consistency and similarly detailed evaluations; for example, QI work over fields can be more easily broadened into neighbouring areas as a more regional exploration tool. Initial work on the Olympus PSTM dataset has been very positive, with the shallower events such as KA and KV in the Cretaceous (Figures 4 and 6) easily propagated over large areas. Attribute analysis shows little or no indications of variations in data quality across 3D survey joins (seams) or between areas. The regional and more local structural trends are now obvious as are the seafloor and the imprint of the seafloor canyons along the platform break (Figure 5). Early results from the PSDM are also very encouraging with further improvement in the data quality and sharpness of faults. However, what will be really interesting is to see how the basin maps out in depth with all the water column and shallow sediments velocity effects that plague time datasets removed. Ultimately this means a far more accurate and integrated burial history across the region can be constructed and the petroleum system better understood. Sedimentary depositional environments and architecture can now move from being prospect or block specific to being seamlessly tracked over a 100 km range. The main prospective intervals lie beneath the Cretaceous and now that nearly all the obvious highs have been drilled recent work has focused more towards partial angle stack data inverted to elastic rock properties and most likely facies models. Generally, the Jurassic to Late Triassic is difficult to separate due to the lack of character variation and contrast, with the exception of the near base Jurassic (JP1) just above the North Rankin/Brigadier Formation (Sinemurian in age). The JP1 is an excellent quality peak which marks the transition into a calcarenite horizon by a major marine transgression over much of the area and is a good proxy for tracking potential reservoirs above and below it. Figure 6: An example of a spectral decomposition slice within the Mungaroo Formation created by stepping down from the JP1 (Near Base Jurassic) preliminary pick. Even though this is a very early poorly-constrained slice a number of channels can be followed over great distances and suggest a dominance of an east–west sediment flow across the region. 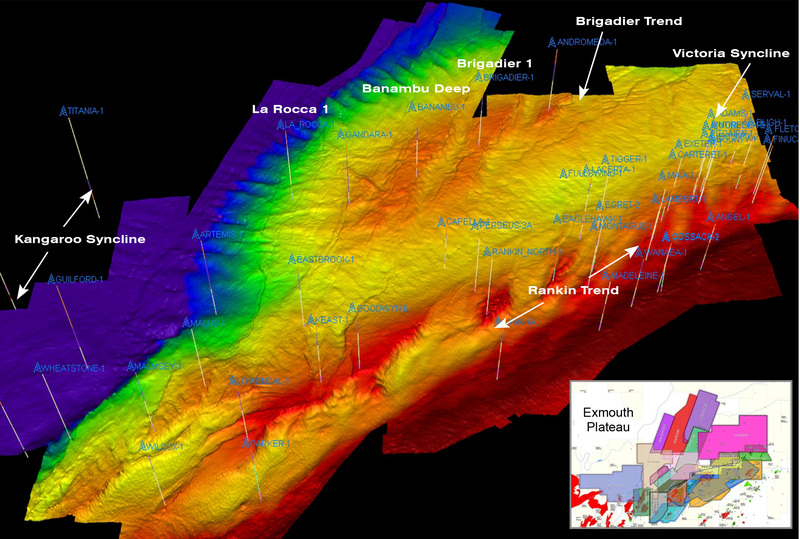 Moving northward of the Rankin trend, the Victoria Syncline and Brigadier Trend have been far less explored since the early Brigadier-1 (1978) and Gandara-1 (1979) wells were drilled. In this area, wells had until recently only tagged the Jurassic and sometimes the uppermost part of the Mungaroo. The Mungaroo Formation is an extensive Triassic fluvio-deltaic to marginal marine sequence of interbedded sands and shales which further to the south has in the last ten years proven very successful deeper down into the Norian. Only recently have wells started to test this interval on the Brigadier Trend. Recently La Rocca-1 (2011) and Banambu Deep-1 (2012) have specifically targeted channel sands supported by quantitative analysis. Post-well studies indicate deeper good quality sands may be locally charged by hydrocarbons, with the upper channels charged down-dip in the Victoria Syncline against sealing faults. 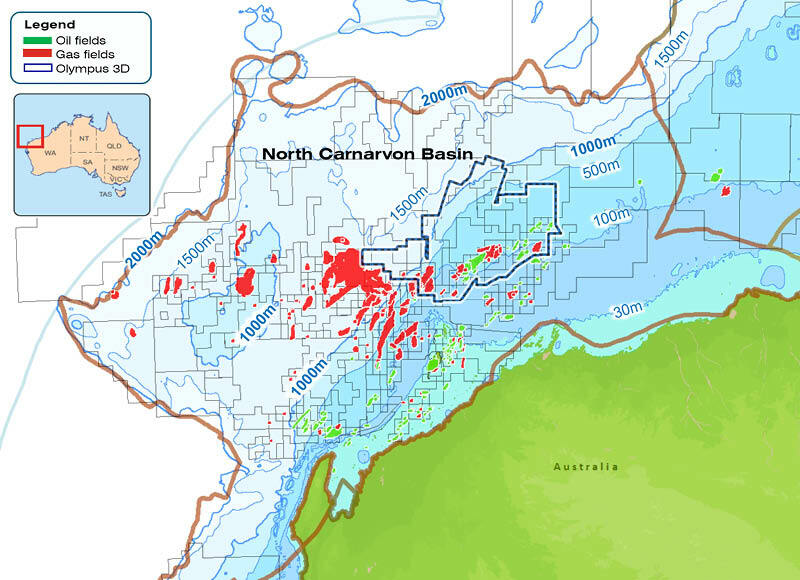 For the Upper Mungaroo sands to be charged on the highs, hydrocarbons will need to follow more complex paths than previously envisaged, indicating that there is still genuine opportunity to find trapped hydrocarbons north of the Rankin Trend. Figure 6 is an example of a spectral decomposition slice stepped down from the JP1 mapped surface through the Mungaroo Formation. It shows how quickly an image of the depositional system can be obtained, even if poorly constrained. What is clear is that charging from the Victoria Syncline is not going to be via a simple drainage pathway on a depth map. Migration is going to be in a more east–west direction along the channels and strongly affected by the northerly-orientated fault grain. Interplay of the meandering channels will also need to be taken into account, plus the effectiveness of the cross-cutting fault seals. Whilst this has been extremely difficult in the past, with only small, disconnected pockets of variable quality 3D seismic available, the Olympus dataset is ideally suited to this type of evaluation and our first forays into this suggest untapped riches are ready to be unlocked. The underexplored deep waters of the east Mediterranean are ready to be investigated for their future oil and gas exploration and drilling potential.